The Offa's Dyke Castles Alternative is a route from Monmouth to Hay-on-Wye that follows a line further east than the Offa's Dyke Path. It gives an excellent alternative to Days 17 and 18 of the End to End Trail, particularly if you have walked Offa's Dyke before and would prefer to follow a different route. The Castles Alternative was originally published by the Offa's Dyke Association in 1980, revised in 1987 and 1994, and the description is given below with their permission, with a few updates of my own (including minor updates to the foreword). 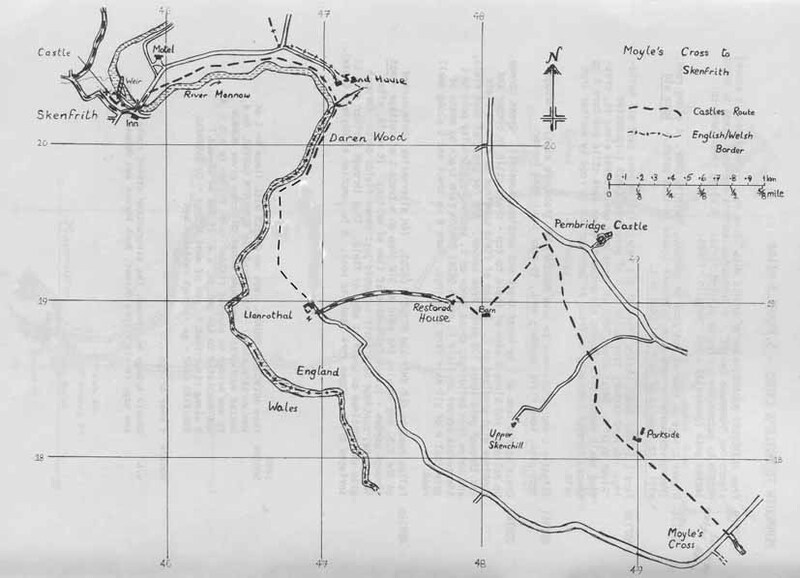 The maps are the original ones from the Offa's Dyke Association booklet, scanned in and then amended where necessary, so my apologies for their presentation. I hope to get time to re-draw them at some point, but don't hold your breath. The maps appear a bit small when viewed from a browser, but if I make them any bigger, Internet Explorer 6 can't print them. Firefox doesn't have the same problem: it's to do with JPEG files not having an "actual size" stored in them I think, so the browsers make their own mind up when printing, and IE6 isn't very good at it (in my view). To get bigger maps, save them as separate images and print them whatever size you want with a graphics package. 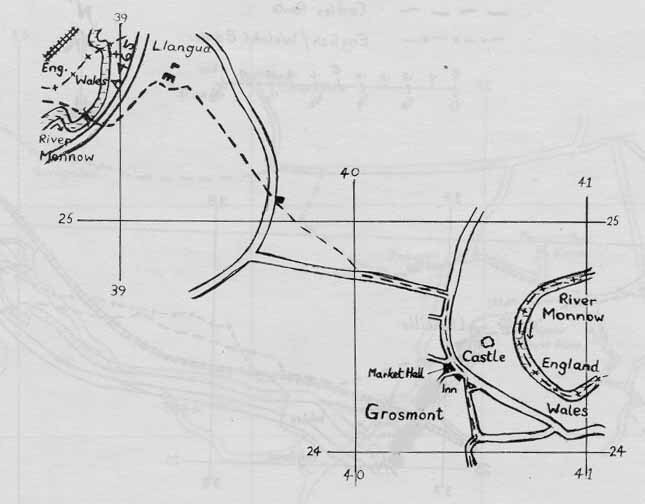 Copyright of the original text, maps and diagrams remains with the Offa's Dyke Association, and it may not be copied without permission. This name is used to describe an alternative (not waymarked) to the official Offa's Dyke Path route between Monmouth and Hay-on-Wye. Existing rights of way are used, but although there is evidence that these paths are receiving increasing usage, the route is seldom as clear as the official route: care must therefore be taken to keep exactly to the route, especially near farmyards and when crossing gates and stiles. Remember to act responsibly when crossing farmland so that others walking this route in the future may be welcomed. 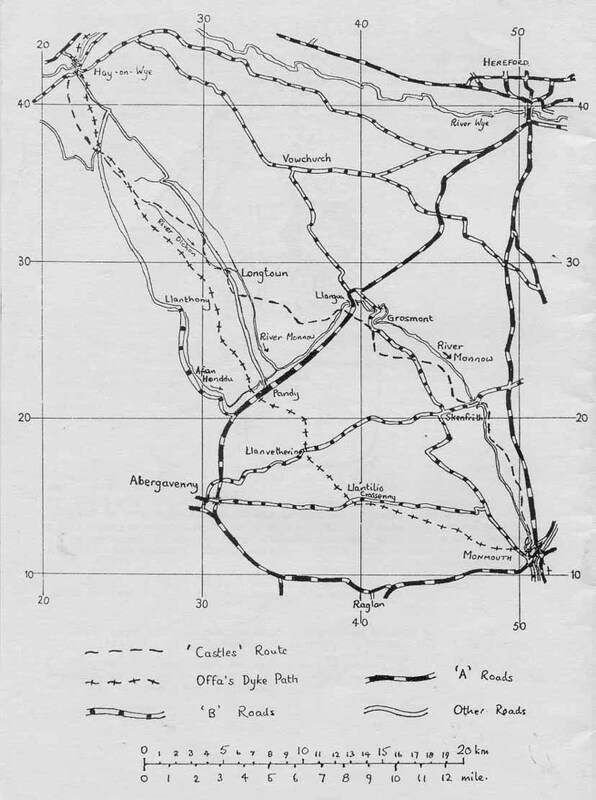 This route misses out White Castle and the Hatterall Ridge, but these exceptions are amply compensated for by the castles at Skenfrith, Grosmont and Longtown and the spectacular Cat's Back Ridge above Llanveynoe, and by the use of generally higher and more interesting terrain. We think many walkers will enjoy this route and we hope that these notes and maps will make its following more practicable. The maps are diagrammatic and should be used with the accompanying notes and the relevant OS maps. We recommend the use of sheets 161 and 162 of the 1:50,000 OS Landranger maps (and a compass to help you use them! ): the relevant 1:25000 Explorer sheets are OL14 - Wye Valley the Forest of Dean, 149 - Hereford and Ross-on-Wye, and OL13 - Brecon Beacons Eastern Area. 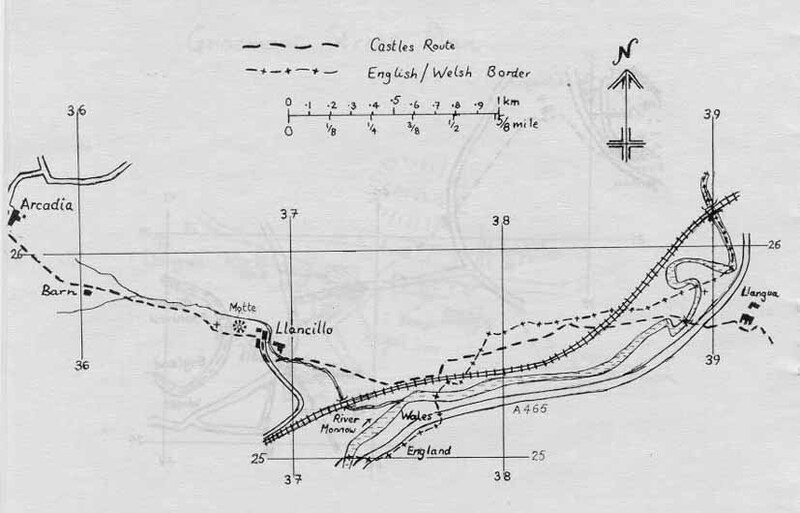 A route between Hay and Monmouth via the Border Castles is briefly mentioned in Frank Noble's early Offa's Dyke guide, and this was followed by his initial YHA groups in the early 1960s. 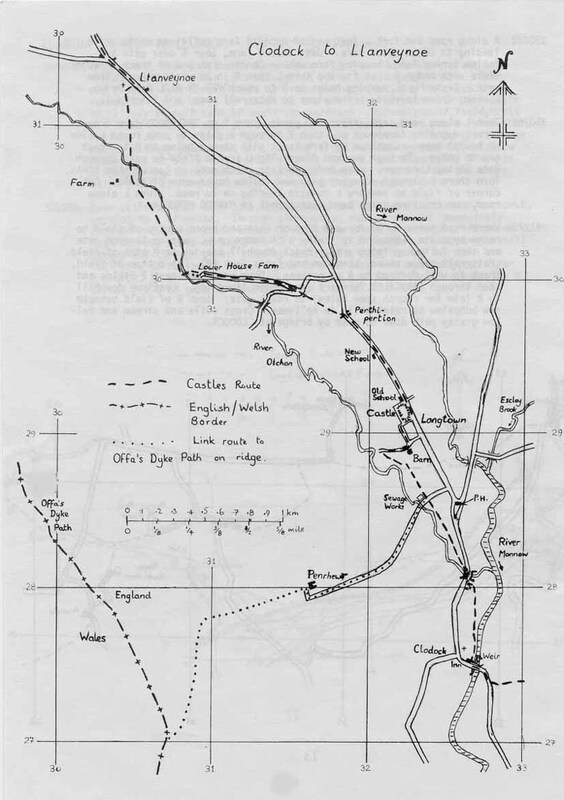 The route was surveyed in 1975 by a team under the direction of Ernie and Kathy Kay, and a set of notes were published following survey. 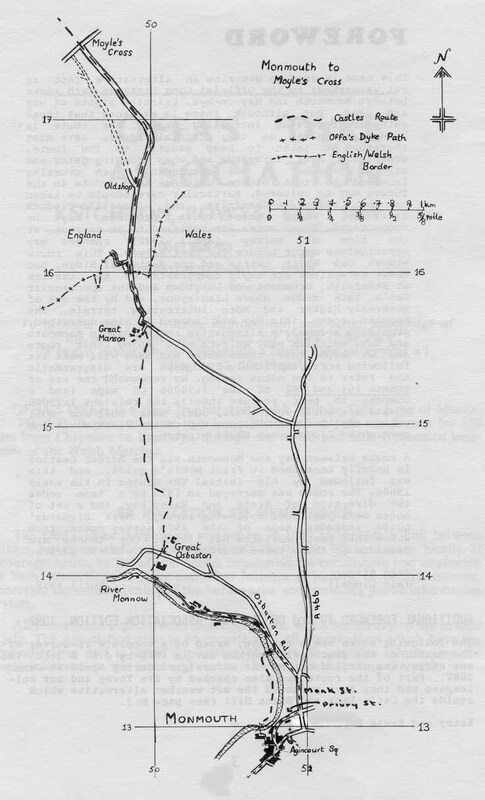 Mark Richards' guide includes maps of the 1975 survey route, from whihc this route deviates but little. Our thanks are extended to these three sources of much aid and advice. John Allder, Iain Liddell, April 1980. 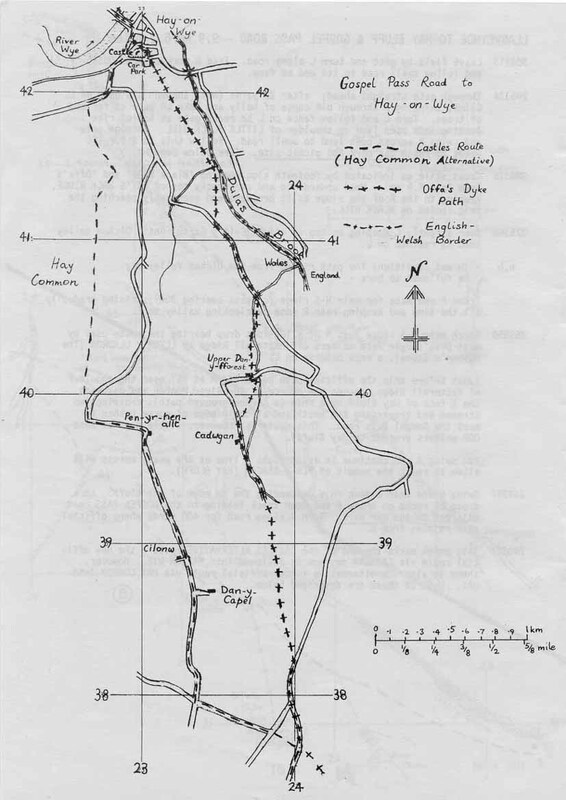 The following notes are a rewrite, based on a complete re-survey of the route, of the description worked out in 1980 by J.A. and I.L. This new survey was carried out by the undersigned during April to June 1987. Part of the route was also checked by Eve Tovey and her colleagues and they have produced the wet weather alternative which avoids the Cat's Back and Black Hill. Kathy and Ernie Kay, June 1987. And one more for the online edition, 2007! I walked most of the route in 2002, and have updated the description and maps to bring them up to date as at that time. I haven't rechecked most of the route since, but it should still be more or less correct - email me if you find anything needs changing. The sections I haven't checked are the final part of the route into Hay, from the road below Hay Bluff (both routes), and the wet weather alternative route. These sections remain unchecked since the 1994 revision to the Offa's Dyke Association booklet. Start at GR508129. From Agincourt Square, turn up Castle Hill (the lane to the left of Woolworth's store) - this leads to Monmouth Castle. Turn right behind Woolworth's and down steps to cross the River Monnow on a new bridge to reach playing fields. (N.b. this bridge is M.O.D. property and isn't dedicated to the public, i.e. it can be closed.) Head right along the river bank to the end of the next bridge - to Vauxhall Training Camp. N.b. should the first bridge be closed, the alternative street route (see map) is via Priory Street, Monk Street and Osbaston Road. GR508134. Go through railings and right (i.e. over the bridge) to the road at the entrance to Vauxhall Training Camp. Go left along the road. (The map shows the alternative route by road from Agincourt Square to this point.) Note the old mill with the remains of a weir and leat on the left. GR507136. Fork left (Forge Road) beside the river at the old weir; follow the road past all the buildings. At the end of the road go into the field and keep straight on to reach the river bank at a large weir. Follow the riverbank, crossing a small footbridge. Beyond a field with a couple of fruit trees in it (below a house), cross a stile into an orchard and turn right up its edge on a clear path, through an iron gate in front of a barn and out to the road by another iron gate. GR501141. Head slightly left and across the road to take Manson Lane (footpath sign). Go through the gateway ahead into the field, then keep the field boundary on your left, to turn left (gap) well before the end of the field. GR502144. Cross a sunken lane on the left by a broad track and continue downhill. Cross a stream. Go up a holloway and along the right edge of a field to its top - cross a stile in the corner and continue with woodland on your left. At the top of the field cross a stile a few yards to the right. Aim just right of both the crest of the next field and the barn visible ahead, then cross a fence on the right, by an electricity pole. Aim across the corner of the field to reach the Great Manson farm track by means of a gate just right of all the main farm buildings. Turn right up a track and left along a minor road. GR499156. Follow the road to Old Shop and Moyle's Cross. (A potential alternative route marked on the OS map leaving the road at Old Shop on a track left of the cottage - not through its garden - was still not followable in 2002. It would, after 100 yards, continue on a shelf in woods just above fields on the left. It would then go through a gate and continue on a shelf at the edge of the field, and through a further gate to meet a surfaced drive. The upper fork then leads to the road; turn right to the junction at Moyle's Cross). GR496175. Go over an iron gate ahead into a field; proceed with a hedge on your right. After two fields, cross the remains of a gate in a holloway in the right corner of the field. Climb the field, with a hedge on your right, then cut across left to a stile 50 yards left of the field corner. Cross and continue in the same direction with the hedge now on your right. Cross another stile in the next field corner and keep straight on, passing well to the left of the farm (Parkside), to go through a gate at the top corner of the large field. GR485190. Cross the field at right angles to the high-voltage power lines and go to a gap at the furthest corner. 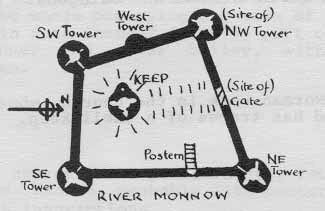 (To reach Pembridge Castle continue on right of next field to a road, turn right and follow the road for 400 yards). 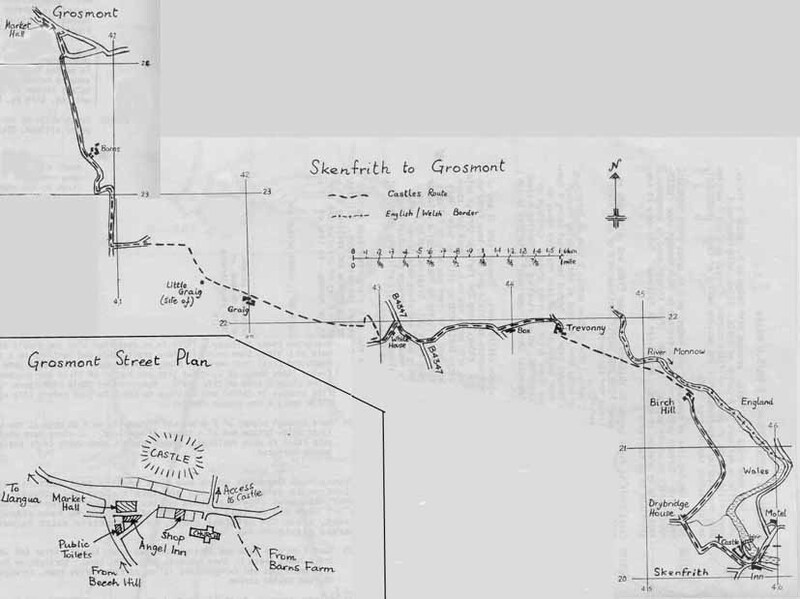 To continue route to Skenfrith: Do not go through the gap, but swing left and contour across the right side of a large field, under power lines, to a large barn, reached at the end by going through a gate in the fence on your right 80 yards before the barn. Do not go through the gate just beyond the barn, but swing right downhill with a fence on your left. Near the bottom of the slope pass a restored house on your left (over a fence) and join its drive to cross the stream. Continue on this drive for 2/3 mile to Llanrothal, at the end of the drive (gate) turning right along the last few yards of road into what used to be Llanrothal Court farmyard but was, in 2002, being converted to housing. (Llanrothal Church - mediaeval - is just to the left along the road at this turn). GR469189. Go straight on past the buildings (on your left), down a slope and straight across the field ahead (no visible path) to a stile in the middle of the opposite side. Cross and go half right in the next field, now on a clear path, and through a gap in a hedge. Continue in the same direction (north, parallel to the river) in the third field, still on a clear path, to join the bank of the River Monnow as it bends to the right. Follow the river to enter Daren Wood over a stile by a gate. The path is soon by the river again. At a sharp lefthand bend in the river cross a tributary stream on a footbridge. Continue along the bank of the Monnow, at first by the edge of the lawns of Sand House to a footbridge and stiles, then through meadows by the river for 2/3 mile into Skenfrith; there are stiles and footbridges where necessary. GR459203. Cross a stile to the road at a sign ("Tregate Bridge 6.5km"), cross the bridge and enter the village, the Bell Inn on your left. GR457202. Turn right at the castle (which should be visited), passing the church on your right and continuing on the road to Drybridge House after crossing a small stream. GR453205. Turn right in front of Drybridge House and follow a surfaced lane ("No Through Road") towards Birch Hill Farm, with views to the River Monnow down to the left. GR454213. In just over 1/2 mile, just before the first farm buildings, go right over a stile, then keep left. Cross two stiles through the garden, between the rightmost building and a pond, to a track, and descend to a stile above the riverbank, continuing in the field above the river. This bit is waymarked for Skenfrith (Three Castles Walk). The path descends almost immediately to a "footbridge" across nothing on its way into trees and a stile. Over this, cross a muddy patch on a boardwalk and then a stream. Then, keeping a hedge on your right, make directly for Trevonny Farm, visible ahead, through three fields. GR444219. In the fourth field go on to a stile in the field corner, then continue, hedge now on your left, turning left on a track through a gate. This avoids Trevonny farm by following a permissive path, with the farm to your right. Turn left along the farm access road, past Box Farm to the B4347. GR433218. Head right along the road for 350 yards, then go left at a junction just before a postbox. Soon you will pass White House Farm on your left. 300 yards from the junction (at the summit of the road) fork right uphill on a track (stile and iron gate), doubling back right immediately after the stile (not through the second gate straight ahead). Follow the track for about 40 yards, then at the first opportunity turn left off the track into the field above (footpath sign). Climb the field (no visible path), gradually converging with the line of trees to the right (on a bank). At the top corner of the field cross a stile in the fence (at the edge of the trees), and climb up right immediately onto the bank to follow a clear track along the top of it, with a fence on your right. A stile takes you into the corner of the next field: continue straight on, now with the fence and line of trees on your left. Cross a stile in the field corner then continue straight on (no visible path), cutting across the bottom of the next field to join a fence. Follow it, now with a wood on your left. A clear (but sometimes muddy) track appears at the next field corner. Follow the track straight on when the fence on the left turns away. A modern barn on your right is all that remains of Upper Graig Farm. Continue through a gate on a track to the far side of the next field. GR416224. Go through the righthand of two gates then diagonally up right to a stile visible at the opposite corner of the field (keep left of the bottom end of a tongue of woodland). Cross it and head left along a farm track (this is soon enclosed). At a sharp lefthand bend the track begins to become surfaced. GR409225. Turn right through (gate and stile) and straight on down a steep track. After 600 yards, the track bears sharp left, then descends past Barns farm. Keep straight on to the left of the main buildings and farmyard and follow the surfaced drive down, through a gate to the road beside a stream. GR406241. Go left over the stream on a footbridge and up a steep path to Grosmont village; turn left up the road to the Market Hall. GR405244. Continue on the main road through the village to the school, then turn left along the road signposted "Abergavenny 11". Continue for about 600 yards, then immediately beyond a large corrugated iron building to the right, cross a stile on the right into a field. Cross diagonally and over a stile (above a gate) to reach a green track below an orchard to the left; follow this until it fades out, then continue to a stile into the road just left of a house. Turn right and proceed down the road for about 150 yards. GR396253. A path enters the second field on the left over a stile; head down the field to a gate in the middle of the hedge and continue down with a fence and holloway, with a stream on your right, to a gate at the end of the next field. Continue down to a gate, turning left just before it to follow a track along the bottom of the field. Cross a stile in the corner. Go half-left here to cross two more stiles into the corner of another field (ignore all the gates). Climb left to the top of the field to the right of another holloway. Using a large solitary tree as an initial bearing, descend to a narrow stile in a fence to reach the A465 just south of Llangua church. GR389255. Cross the A465, go over stile then the River Monnow on an iron footbridge. Take the path trending left from the bridge past a meander in the river to an old gateway near the river, and diagonally right across a field to cross a railway (it is not easy to cross the track formation - take care) by stiles at the end of field. Proceed at a right angle to the railway with a small stream/ditch on your left. At some times of year you could find this field and the next hard to cross due to crops, as the right of way isn't walked much. Before the end of the field, cross the ditch and circle the right edge of a large field. 100 yards before you'd reach the railway again, go over a stile on the right. Cross a field to reach a stile crossing a hedge beside the railway embankment on the left (do not cross the railway via the gate to the left). Follow the embankment to a stile in the left corner of the next field. Head diagonally right across two fields - gate between - to Llancillo farm and cross the stream and stile below and to the left of the farm buildings to reach and go right on the farm drive. GR368254. Cross a stile to the left of a barn to the left of the farmhouse and go up the field to Llancillo church, passing to the left of the motte. Go through the churchyard, over a stile and immediately another one across a small orchard. Continue along the lower edge of a field on a high terrace above a stream on the right for two fields, with a stile between them. Cross a small stream and go through a gate. Head up the centre of the field, making for a barn and tall tree on the horizon. Cross a stile by a gate to the right of a barn and keep a hedge on your left for two fields. At the end of the second field go over stile and footbridge: head diagonally right across the field to a gate into a road below and left of Arcadia farm. GR356262. Turn right along the road, forking left just beyond the Arcadia farm buildings onto the drive leading to Upper House farm. Just before the farm, bear right over a gate and follow a sunken lane, keeping the farm on your left. Continue at the end of the track (stile) and through a field with a hedge on your right. Go through the gate ahead into a young plantation, still with the hedge on your right, then at the top of the plantation turn left, then right in 20 yards through an iron gate. Cross a field, keeping the hedge on your right to reach Pen-yr-Heol farm drive. Go left along the drive to the road: there are fine views towards Hatterall ahead and Skirrid half-left. GR350268. Turn left along the road, and, after 150 yards, turn right up Trelandon farm drive. Turn left opposite the farmhouse and then right through two gates to pass round the left side of a newish barn. Continue up a farm track with a stream below on your right to reach a stile in the hedge. Cross and go straight on with a dry "valley" and fence on your right to a stile at the top of the field. Go straight on across the next field (footpath sign) to a stile, then across the next as well to join a hedge at a corner. Keep straight on, now with the hedge on your left. GR338272. Follow the hedge round to the left, passing through a gate and then immediately right through a gap. Keep the hedge on your left for a few metres to another gate. Go through and descend (no path), keeping to the right side of the field. (Hatterall ridge is ahead, Longtown and Cat's Back are half-right). At the bottom of the field, a track is well-defined to the right of an outcrop. Head down the righthand edge of the next two fields and then through Garngaled farmyard (no longer lived in). Continue downhill slightly to the right (aim for the church seen below), and follow the lefthand side of the fields as you descend (waymarks, stiles and gates) to reach a gate left of a bungalow. Go through and down the right side of field to reach a gate and stile in a holloway. Go through the gate (ignore the stile to the right) and follow the track down to the road by the bridge at Clodock. Turn right along the road. GR327275. Cross the bridge and turn right along the riverside path. Enter the churchyard by a stone stile (the first of many in the area, several of which are recycled headstones! ), and leave by another. Follow the river bank by a garden and through one field into another, leaving the second field through a gate one field away from the river. Keep to the left of the hedge for one field, then cross a wide stile and go across the next field. Cross a stone stile into an orchard and turn left, crossing two stone stiles to reach a road. GR327281. Cross the road bridge and immediately turn left over a stone stile into a field. Make for the corner of the hedge, initially following the river. Cross to other side of the hedge by a stile just beyond the corner. Go through four fields with a hedge on your left to reach the Pen Rhewr farm road. (To visit Longtown village turn right along the road to a T-junction. Turn left here for the post office and shop, 300 yards away, or right for the pub). GR324285. Cross the road and go through two iron gates. Pass a sewage works, cross a field in the same direction and cross a stile. Cross the centre of a field to the far corner above the river. Go through a gate, down a slope by the river and cross a stile in a hedge on a concrete slab. Turn right, at first with a hedge to your right, then across the corner of a field in the same direction, and down to a stile by a gate into a lane. GR321288. Turn right uphill on a lane past a stone barn on your right, and, about 40 yards beyond this, turn left along a hedged track. At a farmhouse, turn right and follow a lane below the ramparts of Longtown Castle (on your left) to join a road just right of the church, shop and Outdoor Education Centre. GR322291. Turn left along the road, with the castle to your left, through the "Roman" camp to leave Longtown with a new school on your left. Follow the road for 1/2 mile to Perthi-Pertion, with cottages on each side of the road. GR318297. Beyond the house, and before a new bungalow on the left, turn left at the second footpath sign pointing left (through a gate into a field), and head away from the road at an angle of 60 degrees (bearing 290 degrees). Pass through the lower of two iron gates. Follow the top (right) side of a field to join a surfaced lane over a stile. After 20 yards, go through an iron gate ahead. Go forward on a roughly surfaced track through trees to another gate, then turn right before the gate, on a track with a fence on your left, parallel with the drive to Lower House Farm. Cross a stile in a fence and continue in the same direction in the edge of a deciduous wood, with a ditch and fence on your left. Leave the wood at a gate and continue along an old sunken grassy lane with a fence now on your right and the farmhouse now below you on the left. Descend to cross a stile near the farmhouse, and follow the path down the slope to reach a footbridge over the River Olchon. GR309303. Cross the footbridge and turn right, keeping between the holloway and stream as far as a waterfall, where you bear slightly left and cross a wooden stile in a fence. Follow the left side of the field, cross a stile in a fence ahead, then swing right away from the farm, descending to recross the River Olchon by a footbridge. Cross the corner of the field to the left, heading upwards to cross a stile. Climb and cross the next field, aiming for the lower edge of a group of trees on the far side, where you cross a stile to reach a slightly sunken green track. Where this track bends right, cross the stile into the corner of a field and climb diagonally, heading to the right of Llanveynoe church. (Celtic crosses and other antiquities make St Beuno's worth a visit). GR304313. Leave the field at a gate and turn L along the road. Take the right fork at Papillon Cottage and follow the minor road to its end at a farm. GR295324. Go through the gate straight ahead; after 20 yards (wet) go through another gate on the left. Climb up through trees to cross a stile at the top of them, cross a small field to cross another stile by a gate into more woodland. Follow a rising track through the trees. Keep right at the top of the wood to cross a stile into a field corner. Follow a path along this narrow field to reach a minor road: follow this to the right for 150 yards to reach a car park and picnic site. (See below for the "bad weather" route). GR288328. Cross the stile by the car park onto the hill. Aim half left upwards onto and over the rocky top of the Cat's Back Ridge, keeping to the right of the ridge as it broadens and eventually reaching the trig point on Black Hill. GR275348. Bearing slightly left keep to the top of the ridge (Crib y Garth) until the head of the Olchon valley is reached on the left. (N.b. in wet conditions the path rising from the Olchon valley may be followed to here.) Trend right and make for the main north-south ridge (compass bearing 300 degrees), rising gradually all the time and keeping near the right edge, overlooking the valley to the east. GR253359. Reach the main north-south ridge just north of a 100-foot drop bearing the route used by most Offa's Dyke Path walkers off Hatterall Ridge by Llech y Lladron (The Robber's Stone), a rock outcrop on the left. (Just before this you cross the official Offa's Dyke Path route - paved along this stretch - which makes it's way towards Hay to your right. It crosses the shoulder of Hatterall Ridge, passes the source of the River Monnow and descends the east face of Hay Bluff by a rhiw (a narrow grooved path), crossing two streams and traversing the heathland at the right edge of gorse bushes to meet the Gospel Pass road. 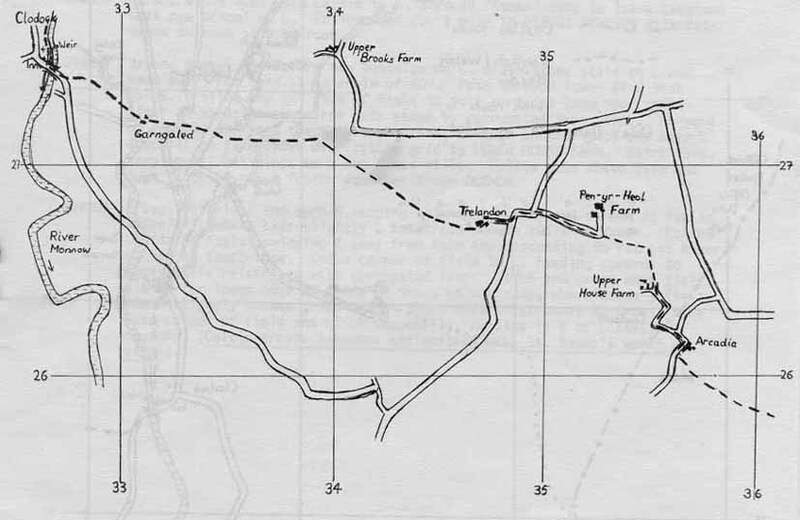 This route is, however, little used as most ODP walkers proceed to Hay Bluff). You, on the other hand, should swing right and continue in as straight a line as the peaty morass will allow to reach the summit of Pen-y-Beacon (Hay Bluff). GR244367. Swing right and then left down a rhiw descending the northwest edge of the bluff: at a group of rocks go sharp right and down a track leading to the Gospel Pass road adjacent to the car park. Turn right along the road for 400 yards to where the ODP rejoins from the right. GR240377. This point marks the end of the Castles Alternative route - the Offa's Dyke Path via Cadwgan may now be followed into Hay-on-Wye. However, there is also the alternative former ODP route via Hay Common into Hay. Both of these are described below. This is the former official ODP route via Hay Common. GR240377. After going 400 yards along the road, 100 yards before a road junction, go down a track on the left to reach a T-junction of roads below. Go forward on the green track beside the road opposite (or on the road itself). Go forward on the road over the cattle grid and immediately take the right fork. GR230397. In 1 1/4 miles (at a point with fine views to Hay) the road bends sharp left at Pen-yr-Henallt. 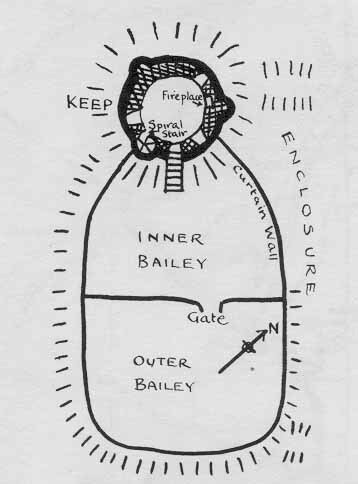 In a further 1/4 mile, at a horseshoe bend in road, where it swings right for the second time, go over a stile to the left of a gate on the left and go forward by a line of old trees, soon passing a long barrow to your left (an exposed stone chamber). Near the end of the field swing right to a stile by a cattle trough in a dingle (beware of going too far down to the right). Over a stile, go up and immediately over another stile into the wood. This leads into a field: go straight across, contouring, through a small patch of wood, across an arm of a field, into another larger wood. GR224403. Cross a boggy area and swing right downhill at a large tree. Head out into the field, pass a cottage (ruined) through a gate to the right, then go left then right round the field to a stile by a gate in the hedge on the left. Go down across the field heading for Hay Church seen in the valley ahead; down left of slope with bracken and gorse, then at the bottom this leads to an enclosed track. Follow the right side of the next field, soon swinging to the right with an iron fence to the right. Where the track swings left by a confluence of small streams, go through the gate below (not the kissing gate to the field above). This soon leads to a footbridge and down a dingle, crossing and recrossing the stream. Follow the track down to the B4350 and follow this right into Hay town centre. GR240377. Continue down the road for a further 1/4 mile. GR240382. Where a wall leaves the road to the left, fork left along an ill-marked track across grass midway between the wall and road. GR238395. Nearly a mile further on, the track converges on a wood and goes through a gate into a sunken track. Ford a stream, then pass Cadwgan farm on your left. GR237397. Beyond the farm, go down the lane and cross a stile on the right, heading diagonally across to the lower side of the field just R of an old incomplete hedge boundary. Take the track sloping down steeply to the right, then swing left and go down to cross a stile into a lane just right of Upper Dan y Fforest farm. Turn left, then immediately right over a stone stile. Continue straight down over three more stiles, with a stream to your right, then go right over a stile and footbridge. Turn left and continue with a stream on your left to a stile and road. GR237409. Turn left along the road for about 400 yards, then cross a stile on the right. Go diagonally left across the field to a stile in the corner, and forward to Cusop Dingle, with Dulas Brook on the right. Go through a gate, over a footbridge, and continue with the main stream on your right. The path continues straight on through kissing gates, with the buildings of Hay visible ahead. The final kissing gate leads to a narrow alley right of a car park. GR233423. Reach the B4348 opposite the castle at Hay-on-Wye. GR288328. ...from the car park cross the stile and follow the well-defined track along the foothills. GR278357. A track on the right soon leads down to reach Craswell road and the Bull's Head public house, but your route is ahead through a gate - the enclosed track can be very muddy. There are several streams and no bridges, but the track is easily negotiable. Continue in a north-westerly direction along the track through fields and wooden gates. After the 8th gate keep straight ahead at a crossing of tracks. GR267364. Cross a stream, bear right along a wider path which swings left ot continue northwest (a lane on the right leads back to the Bull's Head). Keep right after passing through a gate near a sheep pen on the right. GR262366. There is no footbridge, but the ford is easy to negotiate (as is another at GR258368). Cross open land keeping within a short distance of the wire fence on the right. When this fence turns sharply right keep straight ahead - there is no single clear path. GR243375. A short distance after passing old some quarries on the right, the path is joined by the Offa's Dyke Path coming off Hatterall Ridge. GR240377. In 1/4 mile the Gospel Pass road is reached and either of the two routes described above can be followed into Hay. These notes describe briefly some of the buildings to be seen on the route. Many have their own guides or are described in more detail in standard guides to the area. Pembridge Castle is an example of a small, private border castle. It was held by the Wake family up to the 14th century, and then by the Mortimers. The earliest feature is the northwest tower which is early 13th century. The gatehouse and curtain wall are late 13th century. Llanrothal, now only a farm near the Monnow, was once a village and still has a church with a Norman nave and also 13th century features. Only the east end is in use. The route includes two of the Castles of the Trilateral, held by the Duchy of Lancaster as a check to the growing power of the Lords Marcher. The third (White Castle) is on the Offa's Dyke Path north of Llantilio Crosseny. Skenfrith Castle was probably built by the Justiciar, Hubert de Burgh, 1219-1232, and then passed to the Crown at his fall. 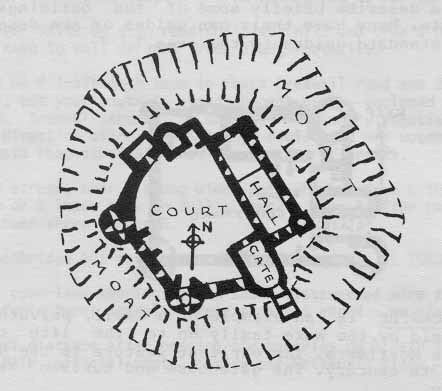 The castle has a moat fed by the Monnow, a curtain wall with a simple gate and drum tower, and in the middle a round three-storey keep on an earlier motte, late 11th century or early 12th century. Skenfrith Church is early English, has a perpendicular tower with a timbered belfry and contains some good woodwork inside. Grosmont Castle is mentioned in 1182 but the earliest masonry is early 13th century, comprising the Great Hall and the curtain wall to the southwest of it. Hubert de Burgh built the gatehouse and three four-storey drum towers, 1220-1240. Further apartments were built c1330, including the elaborate chimney, and a drawbridge was added to the gatehouse, from which the pit survives. Grosmont was a corporate borough until 1860, is the centre of a complex road network, and has a little town hall with an open market area at ground level. The church, which is large and much of which is now unused, is cruciform with a south chapel funded by Henry III's queen, and has an octagonal tower with a spire. Llancillo has Norman work in the church, whose chancel has tufa quoins. The mound has traces of a shell keep. Clodock has a church with Norman nave and chancel arch, and 17th century woodwork including a 3-decker pulpit. The watermill retains the large wheel of 1868 and other machinery. Longtown, the ancient borough of Ewyas Lacy, was the centre of the de Lacies' territory until 1240. There are references to the borough in the 13th century. The church dates nowadays mostly from 1868, but has a Decorated E window and a timber chancel roof of 1640. It was built as a borough chapel because the parish church was too distant. The market place is in front. Longtown Castle may be the earliest round keep in England, being late 12th or early 13th century. It stands on an earlier Norman motte, the whole occupying one side of a large rectangular area of uncertain date (Roman? Saxon? 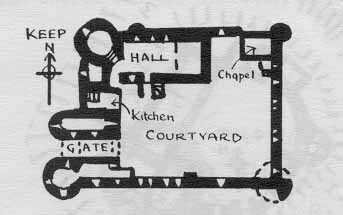 ), part of which was adapted to form an inner and outer bailey, with a cross wall with gatehouse between. Llanveynoe church is of predominantly recent building, but it contains carved panels, probably 11th century, of a crucifixion and a cross with inscriptions.